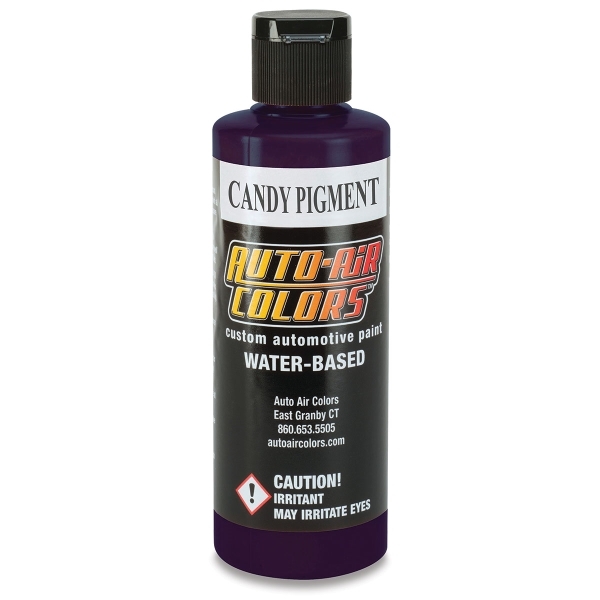 Auto Air 4600 Series Candy Colors are premium, high-performance airbrush paints. Use them to apply graphics over existing finishes. Great for vehicles and signs, these ready-to-spray colors can be used on metal, fiberglass, plastic, vinyl, wood, concrete, and glass. Use these transparent, pigment-based colors over aluminum bases or other Auto Air airbrushing paints, including Metallic, Pearlized, Iridescent, and Hot Rod Sparkle Colors. The underlying coat will interact with light passing through the Candy Pigment Color. Apply Candy Pigment Colors in three to five very light coats and finish with a UV-blocking clear coat for maximum permanence. Reduce the paint using 4012 High Performance Reducer with a 3:1 ratio. ® Createx Colors is a registered trademark.™ Auto Air Colors is a trademark. ™ Candy2o is a trademark.